While you might associate them with outdoorsmen, shotguns have been used in military service for hundreds of years and show no signs of stopping any time soon. Equally as interesting, the Winchester Olin corporation has been providing the military with ammo for many years and has established a long record for quality and dependability. Military grade rounds that are sold on the civilian market can be safely used in the civilian versions of the same famous military firearms we have all come to know. 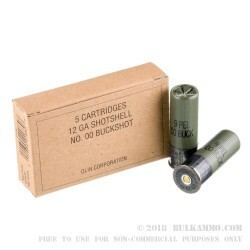 These Winchester 12 gauge shotgun shells are loaded up with 9 lead buffered 00 Buckshot pellets, and are 2-3/4" overall length (after being fired). 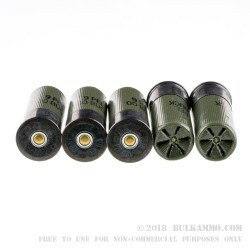 The hulls are Olive Drab Green with high brass black anodized ends to keep the shells up to military specs. These shells are also star-crimped, reloadable, and have non-corrosive shotgun primers. 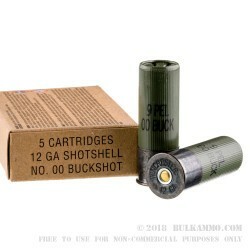 Military spec shells have a history of multiple uses and these loads are no different. 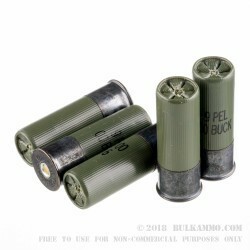 This 12 ga ammo packs a muzzle velocity of 1325 feet per second which can’t be used to hunt with, for target shooting, or for home defense. They come in 5 round boxes that are light weight, simple to pack up, and ready for any time you want to take your shotgun out of the safe and show it off. Get yourself a couple boxes and rest easy knowing you are running ammo with the same specs that our soldiers are using. My Saiga likes it so I like it! A: Hello! Winchester lists the muzzle velocity of this round at 1,325 fps.